Belief is the state of mind in which a person thinks something to be the case, with or without there being empirical evidence to prove that something is the case with factual certainty. Another way of defining belief sees it as a mental representation of an attitude positively oriented towards the likelihood of something being true. In the context of Ancient Greek thought, two related concepts were identified with regards to the concept of belief: pistis and doxa. Simplified, we may say that pistis refers to "trust" and "confidence", while doxa refers to "opinion" and "acceptance". The English word "orthodoxy" derives from doxa. Jonathan Leicester suggests that belief has the purpose of guiding action rather than indicating truth. Epistemology is concerned with delineating the boundary between justified belief and opinion, and involved generally with a theoretical philosophical study of knowledge. The primary problem in epistemology is to understand exactly what is needed in order for us to have knowledge. In a notion derived from Plato's dialogue Theaetetus, where the epistemology of Socrates (Platon) most clearly departs from that of the sophists, who at the time of Plato seem to have defined knowledge as what is here expressed as "justified true belief". 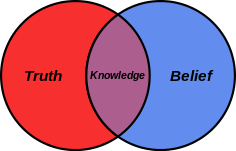 The tendency to translate from belief (here: doxa - common opinion) to knowledge (here: episteme), which Plato (e.g. Socrates of the dialogue) utterly dismisses, results from failing to distinguish a dispositive belief (gr. 'doxa', not 'pistis') from knowledge (episteme) when the opinion is regarded true (here: orthé), in terms of right, and juristically so (according to the premises of the dialogue), which was the task of the rhetors to prove. Plato dismisses this possibility of an affirmative relation between belief (i.e. opinion) and knowledge even when the one who opines grounds his belief on the rule, and is able to add justification (gr. logos: reasonable and necessarily plausible assertions/evidence/guidance) to it . It is important to keep in mind that the sort of belief in the context of Theaetetus is not derived from the theological concept of belief, which is pistis, but doxa, which in theological terms refers to acceptance in the form of praise and glory. Our common-sense understanding of belief may not be entirely correct, but it is close enough to make some useful predictions - This view argues that we will eventually reject the idea of belief as we know it now, but that there may be a correlation between what we take to be a belief when someone says "I believe that snow is white" and how a future theory of psychology will explain this behaviour. Most notably, philosopher Stephen Stich has argued for this particular understanding of belief. Strategic approaches make a distinction between rules, norms and beliefs as follows: (1) Rules. Explicit regulative processes such as policies, laws, inspection routines, or incentives. Rules function as a coercive regulator of behavior and are dependent upon the imposing entity’s ability to enforce them. (2) Norms. Regulative mechanisms accepted by the social collective. Norms are enforced by normative mechanisms within the organization and are not strictly dependent upon law or regulation. (3) Beliefs. The collective perception of fundamental truths governing behavior. The adherence to accepted and shared beliefs by members of a social system will likely persist and be difficult to change over time. Strong beliefs about determinant factors (i.e., security, survival, or honor) are likely to cause a social entity or group to accept rules and norms. This theory of knowledge suffered a significant setback with the discovery of Gettier problems, situations in which the above conditions were seemingly met but that many philosophers disagree that anything is known. Robert Nozick suggested a clarification of "justification" which he believed eliminates the problem: the justification has to be such that were the justification false, the knowledge would be false. If so we can say belief becomes knowledge (accepted reality) when it is justified. Many philosophers have since attempted to eliminate the Gettier problems by adding a fourth condition, changing the conditions, or arguing that the agent still has knowledge in the Gettier cases. First used in the context of Early Christianity, orthodoxy is a religious belief that closely follows the edicts, apologies, and hermeneutics of a prevailing religious authority. In the case of Early Christianity, this authority was the communion of bishops, and is often referred to by the term Magisterium. The term orthodox was applied almost as an epithet to a group of Jewish believers who held to pre-Enlightenment understanding of Judaism and now known as Orthodox Judaism. The Eastern Orthodox Church of Christianity, as well as the Catholic Church, consider themselves to be the true heir to the Early Christian belief and practice. The antonym of orthodox is heterodox and those adhering to orthodoxy often accuse the heterodox of apostasy, schism, or heresy. 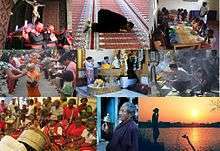 Some anthropologists report cultures in which gods are involved in every aspect of life - if a cow goes dry, a god has caused this, and must be propitiated, when the sun rises in the morning, a god has caused this, and must be thanked. Even in modern Western cultures, many people see supernatural forces behind every event, as described by Carl Sagan in his book The Demon-Haunted World. In addition, beliefs about the supernatural or metaphysical may not presuppose a difference between any such thing as nature and non-nature, nor between science and what the most educated people believe. In the view of some historians, the pre-Socratic Athenians saw science, political tradition, culture and religion as not easily distinguishable, but all part of the same body of knowledge and wisdom available to a community. ↑ Leicester, Jonathan (2008). "The nature and purpose of belief". Journal of Mind and Behavior. 29 (3): 219–239. Retrieved 29 December 2015. The purpose of belief is to guide action, not to indicate truth. ↑ Compare: - "The 'mind-body problem', for example, so central to philosophy of mind, is in part the question of whether and how a purely physical organism can have beliefs." Retrieved 01 July 2016. ↑ Gettier, E. L. (1963). "Is justified true belief knowledge?". Analysis. 23 (6): 121–123. doi:10.1093/analys/23.6.121. JSTOR 3326922. ↑ Goldman, A. I. (1967). "A causal theory of knowing". The Journal of Philosophy. 64 (12): 357–372. doi:10.2307/2024268. JSTOR 2024268. ↑ Bell, V.; Halligan, P. W.; Ellis, H. D. (2006). "A Cognitive Neuroscience of Belief". In Halligan, Peter W.; Aylward, Mansel. The Power of Belief: Psychological Influence on Illness, Disability, and Medicine. Oxford: Oxford University Press. ISBN 0-19-853010-2. ↑ Baker, Lynne Rudder (1989). Saving Belief: A Critique of Physicalism. Princeton University Press. ISBN 0-691-07320-1. ↑ Chairman of the Joint Chiefs of Staff, U.S. Army (2012). Information Operations. Joint Publication 3-13. Joint Doctrine Support Division, 116 Lake View Parkway, Suffolk, VA. p. 22. ↑ MacIntosh, J. J. (1994). "Belief-in Revisited: A Reply to Williams". Religious Studies. 30 (4): 487–503. doi:10.1017/S0034412500023131. ↑ Macintosh, Jack. "Belief-in". The Oxford Companion to Philosophy. p. 86. ISBN 978-0-19-926479-7. ↑ R. Arena & A. Festré. Knowledge, Beliefs and Economics. Edward Elgar Publishing 1 Jan 2006, 288 pages, ISBN 1847201539. Retrieved 2015-08-09. 1 2 3 Wyer, R. S., & Albarracin, D. (2005). Belief formation, organization, and change: Cognitive and motivational influences. In D. Albarracin, B. T. Johnson, & M. P. Zanna, The Handbook of Attitudes (273-322). New York, NY: Psychology Press. ↑ Argyle, Michael (1997). The Psychology of Religious Behaviour, Belief and Experience. London: Routledge. p. 25. ISBN 0-415-12330-5. Religion, in most cultures, is ascribed, not chosen. ↑ Hoffer, Eric (2002). The True Believer. New York: Harper Perennial Modern Classics. ISBN 0-06-050591-5. ↑ Rothschild, Babette (2000). The Body Remembers: The Psychophysiology of Trauma and Trauma Treatment. New York: W. W. Norton & Company. ISBN 0-393-70327-4. ↑ Rowley, Anna (2007). Leadership Therapy: Inside the Mind of Microsoft. Basingstoke: Palgrave Macmillan. p. 69. ISBN 1-4039-8403-4. ↑ The received view holds it that Plato's theory presents knowledge as remembering eternal truths and justification reawakens memory, see Fine, G. (2003). "Introduction". Plato on Knowledge and Forms: Selected Essays. New York: Oxford University Press. pp. 5–7. ISBN 0-19-924558-4. ↑ Chisholm, Roderick (1982). "Knowledge as Justified True Belief". The Foundations of Knowing. Minneapolis: University of Minnesota Press. ISBN 0-8166-1103-3. 1 2 Wyer, R. S. (1970). "Quantitative prediction of belief and opinion change: A further test of a subjective probability model". Journal of Personality and Social Psychology. 16 (4): 559–570. doi:10.1037/h0030064. 1 2 Wyer, R. S.; Goldberg, L. (1970). "A probabilistic analysis of the relationships among beliefs and attitudes". Psychological Review. 77 (2): 100–120. doi:10.1037/h0028769. ↑ Wittgenstein, Ludwig (2007). Lectures and Conversations on Aesthetics, Psychology and Religious Belief. University of California Press. p. 53. ISBN 0520251814. ↑ Braithwaite, R. B. (1975). An empiricist's view of the nature of religious belief. Norwood Editions (Norwood, Pa.). ISBN 088305955X. ↑ "'The Fundamentals: A Testimony to the Truth'". 2012-11-27. Retrieved 2012-11-28. ↑ "Roy Moore: 'We Have No Morality Without an Acknowledgment of God'". Christianity Today. 2005-03-07. Retrieved 2006-05-19. ↑ Repa, J. Theodore (1998-10-18). "Building Community: The Marriage of Religion and Education". Retrieved 2006-05-19. ↑ Larson, David B.; Susan S. Larson; Harold G. Koenig (October 2000). "Research Findings on Religious Commitment and Mental Health". Psychiatric Times. 17 (10). Retrieved 2006-05-19. ↑ Russell, Bertrand (1927-03-06). "Why I am Not a Christian". Archived from the original on 2006-11-19. Retrieved 2006-05-19. ↑ Faith is the commitment of one’s consciousness to beliefs for which one has no sensory evidence or rational proof. When a person rejects reason as their standard of judgment, only one alternative standard remains to them: feelings. A mystic is a person who treats feelings as tools of cognition. Faith is the equation of feeling with knowledge. To practice the “virtue” of faith, one must be willing to suspend one’s sight and one’s judgment; one must be willing to live with the unintelligible, with that which cannot be conceptualized or integrated into the rest of one’s knowledge, and to induce a trance like illusion of understanding. One must be willing to repress one’s critical faculty and hold it as one’s guilt; one must be willing to drown any questions that rise in protest—to strangle any trust of reason convulsively seeking to assert its proper function as the protector of one’s life and cognitive integrity. The human need for self-esteem entails the need for a sense of control over reality—but no control is possible in a universe which, by one’s own concession, contains the supernatural, the miraculous and the causeless, a universe in which one is at the mercy of ghosts and demons, in which one must deal, not with the unknown, but with the unknowable; no control is possible if a person proposes, but a ghost disposes; no control is possible if the universe is a haunted house. A person's life and self-esteem require that the object and concern of his or her consciousness be reality and this earth—but morality, people are taught, consists of scorning this earth and the world available to sensory perception, and of contemplating, instead, a “different” and “higher” reality, a realm inaccessible to reason and incommunicable in language, but attainable by revelation, by special dialectical processes, by that superior state of intellectual lucidity known to Zen-Buddhists as “No-Mind,” or by death. A person's life and self-esteem require that this person take pride in their power to think, pride in their power to live—but morality, people are taught, holds pride, and specifically intellectual pride, as the gravest of sins. Virtue begins, people are taught, with humility: with the recognition of the helplessness, the smallness, the impotence of one’s mind. A person's life and self-esteem require the person to be loyal to their values, loyal to their mind and its judgments, loyal to their life—but the essence of morality, people are taught, consists of self-sacrifice: the sacrifice of one’s mind to some higher authority, and the sacrifice of one’s values to whoever may claim to require it. A sacrifice, it is necessary to remember, means the surrender of a higher value in favor of a lower value or of a nonvalue. If one gives up that which one does not value in order to obtain that which one does value—or if one gives up a lesser value in order to obtain a greater one—this is not a sacrifice, but a gain. Remember further that all of a person's values exist in a hierarchy; people value some things more than others; and, to the extent that a person is rational, the hierarchical order of the person's values is rational: that is, the person values things in proportion to their importance in serving this person's life and well-being. That which is inimical to their life and well-being, that which is inimical to their nature and needs as a living being, the person disvalues. Conversely, one of the characteristics of mental illness is a distorted value structure; the neurotic does not value things according to their objective merit, in relation to the person's nature and needs; they frequently value the very things that will lead them to self-destruction. Judged by objective standards, they are engaged in a chronic process of self-sacrifice. But if sacrifice is a virtue, it is not the neurotic but the rational person who must be “cured.” They must learn to do violence to their own rational judgment—to reverse the order of their value hierarchy—to surrender that which their mind has chosen as the good—to turn against and invalidate their own consciousness. Waldau, Paul (2001). The Specter of Speciesism: Buddhist and Christian Views of Animals (American Academy of Religion Books). Oxford University Press, USA. ISBN 978-0195145717.